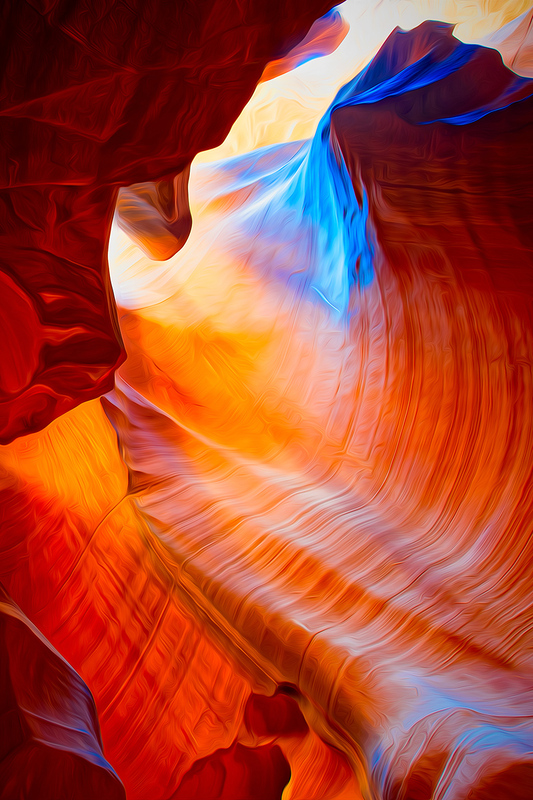 Antelope Canyon is a dreamlike landscape of otherworldly shapes, constantly changing colors and moving shafts of sunlight. Many years ago, herds of Pronghorn Antelope roamed freely in, and around the canyon, which explains the name. This incredible canyon has been created over many thousands of years by the relentless forces of water and wind, slowly carving and sculpting the sandstone into forms, textures, and shapes. 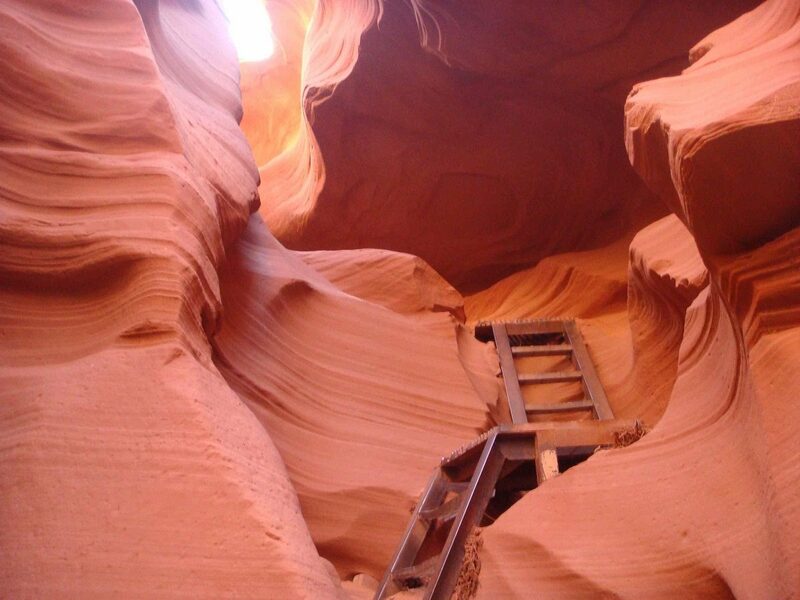 The caves are found within the Lake Powell area in the dry desert Southwest state of Arizona, United States of America. 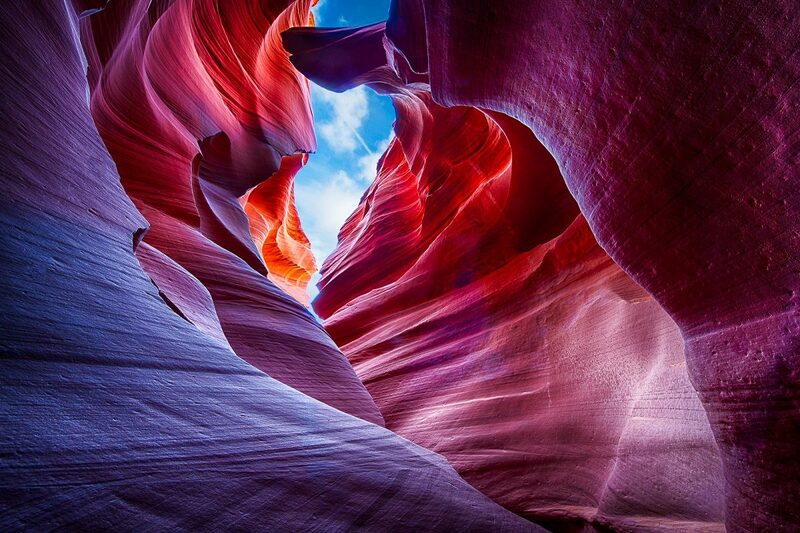 The Antelope Canyon is by far one of the most interesting and best tourist attractions in the United States. The caves are a 2 hour drive from the Grand Canyon and a 4 hour drive from Las Vegas and make for an excellent road trip and stopover from two of the biggest tourist attractions in the USA! Upper Antelope’s light beams appear to be more dramatic and seemed to be the more guaranteed route for stunning photographs. Because of these reasons the Upper canyon has better photography, lighting and colour schemes. There are more people, it’s more expensive, but it’s easier to walk around as the canyons are all flat walking surfaces. Also the upper canyon seems to be more popular because the entrance and entire length are at ground level, requiring no climbing. While the Lower canyon may seem like the ugly sister, it’s not to be without consideration. 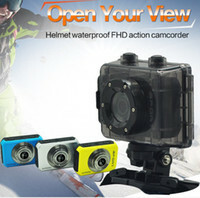 For the more adventurous explorer, the lower canyon will offer a much less crowded space while still offering excellent opportunities for photographs. You will navigate through the bendy caves through climbing up and down ladders. To capture the famous light beams one will need to visit mid-day during the months April to September. 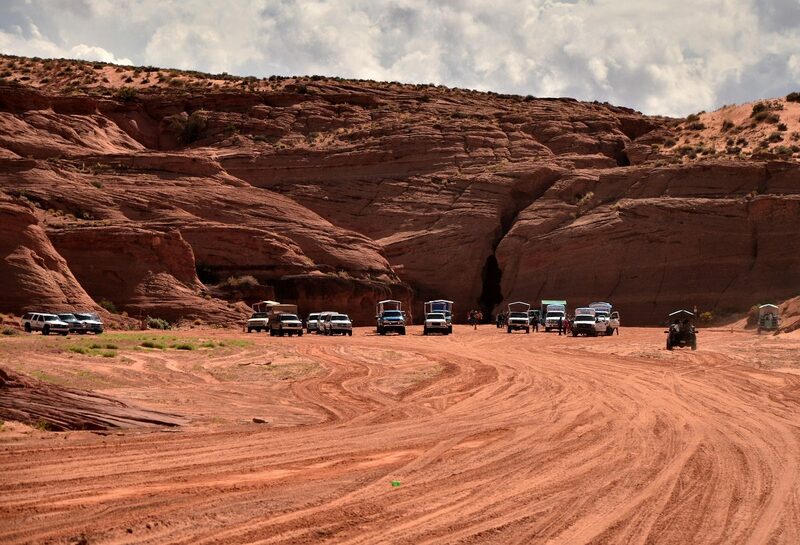 The tours begin with you climbing aboard safari-style vehicles that transport visitors to the site of Antelope Canyon where you spend several hours exploring, learning about the geology, history and ecology of the caves, and of course; taking photos. For Upper Antelope Canyon you’re looking at about a $32-$40USD entrance fee and for Lower Antelope it’s only $20.00USD. Theres also the option to have a guided tour with instructions on when and how best to capture the vivid lights through the caves. 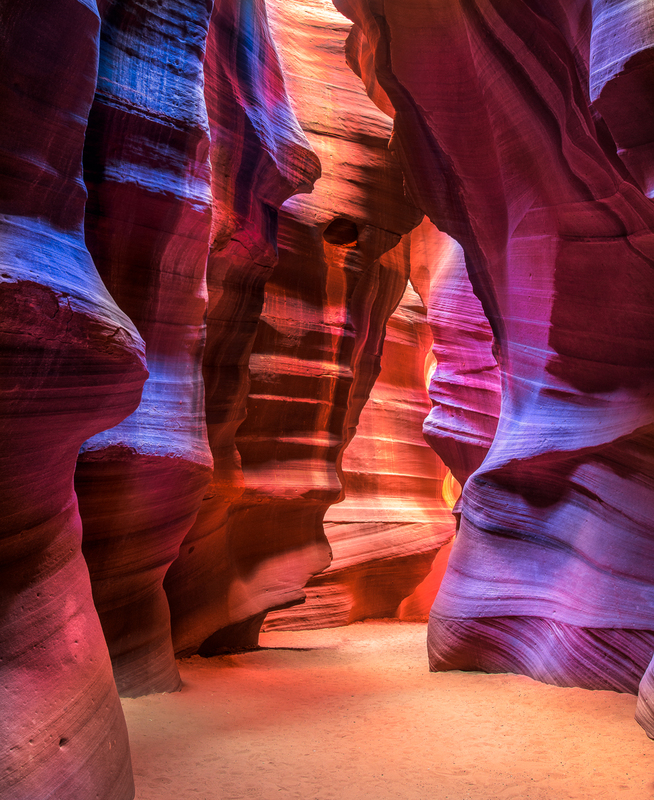 A photography tour at Upper Antelope will cost you around $80.00USD – *must bring your own camera gear. Also, you’re entering local Navajo land and may be required to pay an additional entrance fee of $6.00USD (although most tours include the fee). 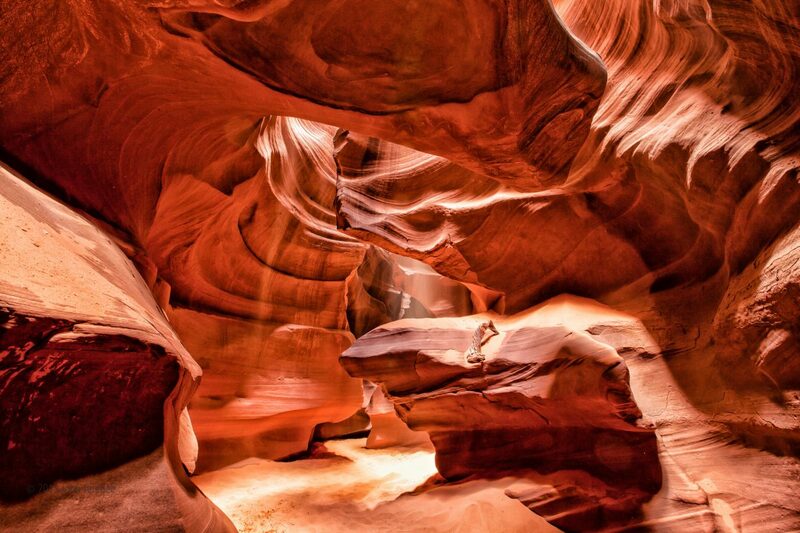 Tours to Antelope canyon are very popular the road to Antelope Canyon is gated by the Navajo Nation and entry is restricted to guided tours led by authorized tour guides. Advanced bookings are highly recommended and there are many agencies and guides that accept over the phone or online bookings. Previous Post → An Adults Guide to the Dominican Republic!